Are you a business which is having trouble funding your growth plans? Learn how to access alternative forms of finance, including funding for exporting, at a Funding for growth seminar by ActionCOACH Solent and Hampshire Chamber of Commerce. 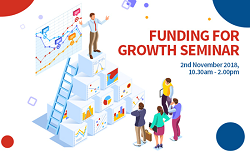 The seminar will bring together four key growth funding solutions for your business, explain what the criteria and conditions are to access these and the mistakes to avoid. Keynote speakers from Funding Circle, Oxford Investment Opportunity Network, UK Export Finance, Solent LEP, ActionCOACH Solent.